shoals and swatchways of the Thames Estuary and surrounding rivers, extending from Lowestoft to Ramsgate. 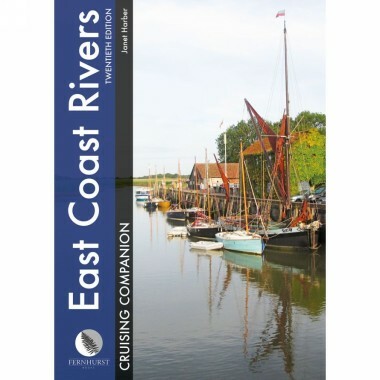 Dating back to 1956 when Jack Coote, Jan's father, produced the first black and white edition, East Coast Rivers continues to provide comprehensive up-to-date pilotage and nautical information based on years of local knowledge and is complemented by port information and local maritime history, helping cruising sailors to make the most of their visit to the East Coast. The text is illustrated throughout with updated charts and photographs, including spectacular aerial shots of a number of the rivers and entrances that make up this cherished cruising ground. Not only a pilot guide, this is the memoir of a family's history, exploring, capturing and celebrating this extraordinary sailing area. As a child, Janet Harber's weekends and holidays were spent exploring the rivers and creeks of the Thames Estuary, helping her father with the research for this book. She took it over in 1998 and still sails these waters and lives a stone's throw from the river Alde.